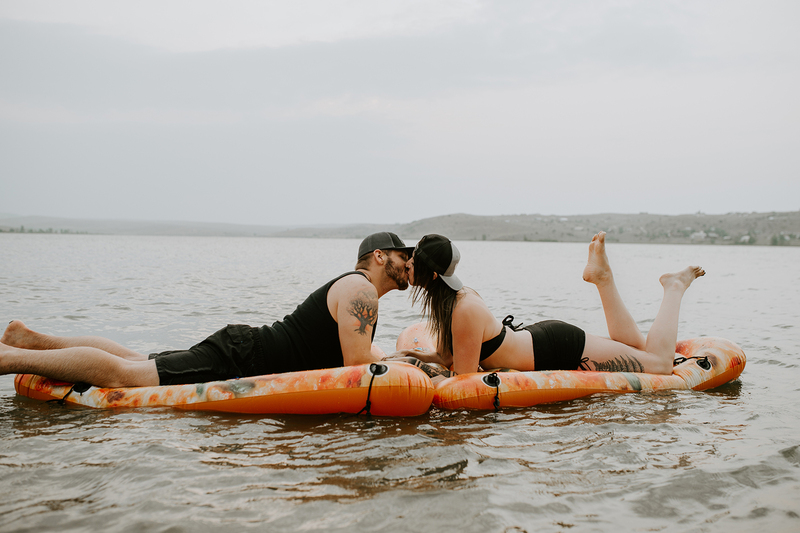 That one summer day when we went on a lake photoshoot, with the theme of pizza on pizza. I’ve been heckling her to go on a shoot with me with her sweet sweet boyfriend. I say sweet because what kind of guy willingly goes on TWO shoots in one week…plus another shoot in June (remember the poppy shoot?) So yes, he is sweet and really likes her I guess! Jade and I were in Billings one day, when we saw these pizza floaties. The whole lake photoshoot was imagined in about 30 seconds. Add some Red Lodge Pizza Co pizza and Red Lodge Ales Brewing Company + Big Sky Brewing Co, and this is what you get. It wasn’t the warmest summer day, not going to lie. There was a breeze and the clouds and smoke kept it a little cooler than normal. Not that I am complaining, I only got in thigh deep. They floated around, ate a slice, had a beer, and made a heart on the beach. That wasn’t even my idea, they’re just naturally too cute I guess.